There are several viral, bacterial, fungal, and parasitic infections of humans that generate asymptomatic infections (AIs). In some cases, AIs do not cause any harm to humans, but in most of the situations they ultimately led to disease. The asymptomatic plasmodial infection (API) has been frequently reported in hyper-endemic regions; however, it has received significant attention only in recent years due to the global goals of malaria elimination and eradication. In October 2007, the call made by Melinda and Bill Gates to make malaria eradication a goal of their Foundation was immediately endorsed by the WHO’s General Director which created a momentum to move beyond malaria control to at least achieve the goal of elimination, if eradication is not possible. According to WHO, malaria elimination means the interruption in local malaria transmission by a specified malaria parasite species in a defined geographic area; therefore, continued measures are required to prevent re-establishment of transmission. On the other hand, malaria eradication is the permanent reduction to zero of the worldwide incidence of malaria infection caused by all human malaria parasites species. Intervention measures are no longer needed, after achieving eradication. Malaria control, elimination and eradication are strongly related with asymptomatic and submicroscopic infections. An insightful definition of API is presence of erythrocytic plasmodial stages in a person without fever and other symptoms compatible with malaria, i.e. a positive blood diagnostic test in an asymptomatic individual. A list of diagnostic criteria used in different studies, for defining API has been listed by Laishram et al in 2012; however, there is no standard definition of API and criteria used in earlier studies are very different. Most definitions of API involve detection of erythrocytic parasites in absence of clinical malaria symptoms (generally fever) during a specified time frame. Some definitions have included parasite density thresholds to define the cases, which means that only a febrile subject with a parasite density above the cut-off is a case of symptomatic malaria, while a febrile subject with lower parasite density than the cut-off is an asymptomatic case. The sensitivity of the diagnostic test used in different studies play a major role in detection of APIs. Microscopy has been the gold standard in malaria research and remains as a point-of-care diagnostic in clinical and epidemiological settings. An expert microscopist can detect 50 parasites/μl. The rapid diagnostic tests (RDTs) detect 100–200 parasites/μl. Polymerase chain reaction (PCR)-based tests improved the detection limit for malaria infection >1 parasite/μl. It may be noted that the rRNA gene copy number varies from 4 to 8 units per genome in Plasmodium, hence, parasites/μl and DNA copies/μl are not equivalent units. Submicroscopic parasite densities (microscopy negative and PCR positive) are common in adults and in chronic infections; studies have reported that microscopy detects only about 54% of all PCR-detectable plasmodial infections,. There is a relationship between submicroscopic plasmodial infections (SPI) and API; most of SPI are API and vice versa, and most of patients with microscopic infections have symptoms (no API). The available information about API is scarce, and the global elimination and eradication goals require this event is well known in different populations (children, adults, pregnant women, etc.) and malaria transmission settings. It has been reported that the API is much more common in pregnant women than in non-pregnant women or men. In addition, API on pregnant women caused by P falciparum are evidently associated with maternal anaemia,. Moreover, SPIs affect health of both pregnant women and babies; when SPI is present, problems such as maternal anaemia and low birth weight newborns have a mean frequency of 42 and 16%, respectively,,. This study was aimed to estimate the prevalence of API in pregnant women across the world through review of the existing scientific literature. For data compilation, references were searched on PubMed and Lilacs (a comprehensive database of scientific and technical literature of Latin America and the Caribbean), till August 15, 2016, without restriction of language. The PubMed search included two search methodologies; the first method was based on the MeSH protocol, wherein the MeSH term Malaria was searched as major topic (i.e. 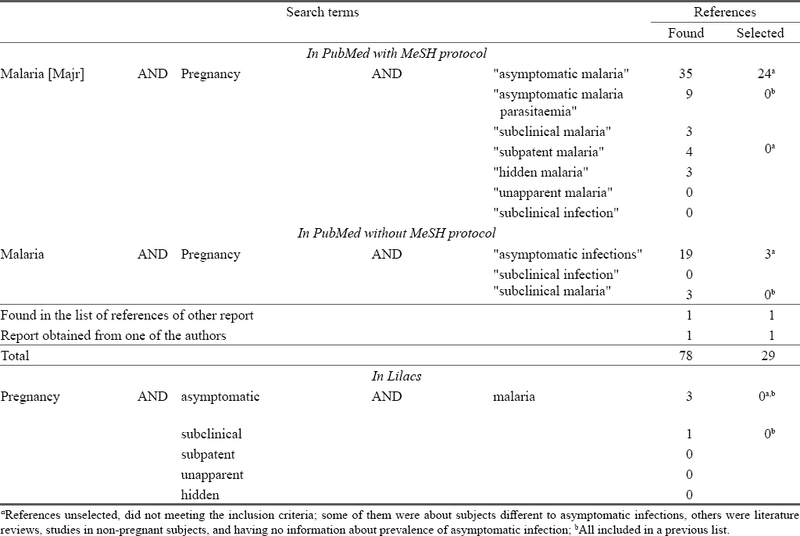 “Malaria”[Majr]), followed by the MeSH term Pregnancy, and following expressions in quotes: “asymptomatic malaria”, “asymptomatic malaria parasitaemia”, “subclinical malaria”, “subpatent malaria”, “hidden malaria”, “unapparent malaria”, “subclinical infection”, while the second search was performed without the MeSH protocol, using the words Malaria and Pregnancy and the expressions “asymptomatic infections”, “subclinical infection” and “subclinical malaria”. On Lilacs, the keywords pregnancy and malaria were combined with asymptomatic, subclinical, subpatent, unapparent and hidden. [Table 1] summaries the search strategies and results, for both PubMed and Lilacs. those reporting the use of the malaria diagnostic tests. Data of the references included were compiled in Microsoft Excel and the statistical analysis was performed with SPSS 10.0. A total of 78 references were found on PubMed, out of which only 27 met the inclusion criteria,,,,,,,,,,,,,,,,,,,,,,,,,,. An additional study/reference was found in the list of references of another report, which was not included in this review, as it did not mentioned about data related to calculation of API prevalence. Another study included was obtained from one of its authors. On Lilacs, four references were found, but two of them were already obtained on PubMed search, and the other two did not meet the inclusion criteria. A total of 29 reports were analyzed in this review; 72.4% (21/29) were carried out in Africa, 17.2% (5/29) in Asia and 10.3% (3/29) in South America [Table 2]. The malaria diagnostic tests used in most of the studies were thick blood smear and/or qPCR. The mean prevalence of API for pregnant women calculated on the basis of 29 reports was 10.8% (3382/31186) [Table 2]; the highest mean prevalence was detected in Nigeria [44.4% (1690/3804; 13 studies], and the mean prevalence in other seven African countries (Cameroon, Ghana, Burkina Faso, Democratic Republic of Congo, Uganda, Ethiopia, and Madagascar; eight studies) was 21.7% (593/2738). In Thailand, Bangladesh and Saudi Arabia, the mean prevalence of API was 3.3% (754/22627; five studies), and the mean prevalence in South America was 22.1% (171/775; three studies). The prevalence of API had high variation even within the countries and with the same diagnostic test. Number of studies per year varied from 1 to 5, with a mean of 2.6 and median of 3; apparently, the number of studies decreased over time, and there was a significant negative correlation in prevalence and time in years (rho = − 0.506; p = 0.005; n = 29). Asymptomatic plasmodial infections play an important role in different populations and malaria transmission settings, however, it has received significant attention only in recent years, mainly due to the global goals of malaria elimination and eradication. The global frequency of API in pregnant women analyzed on the basis of this review was 10.8% (3382/31186). In general, studies on this subject are limited across the world; around 45% of reports included in this review were carried out in Nigeria, and another 26% of studies were from other seven African countries. Reporting of studies related to the prevalence of API in pregnant women was much less from Asia, Pacific and America. Submicroscopic infection rate estimated in general population of South America was 10%; however, it varies from country to country. For example in Brazil data ranged from 0.7 to 39.5%; in Africa, submicroscopic infection in non-pregnant subjects ranged from 12 to 21%, across the Eastern, Central or Western regions of Africa (calculated on basis of a study carried out by Okell et al). According to Laishram et al, two classes of immune response develop in the APIs: 1) an antidisease immunity that allows one to carry parasite loads without symptoms, and 2) an antiparasite immunity that may be responsible for the suppression of parasite loads after a certain age, which is likely a factor of exposure-related clinical immunity. In addition, exposure-related immunity may be achieved much earlier in life for individuals who live in low transmission regions due to predictably low parasite genetic diversity and few overlapping infections. APIs can maintain and perpetuate the transmission to anophelines. In a recent study Sutherland observed that that certain human communities living under moderate-to high-intensity malaria transmission in both African and Asian settings may sustain patterns of Plasmodium spp infections similar to those of the great apes or the macaques of Borneo, in that multispecies, low-density, asymptomatic parasitaemia is observed in a significant proportion of individuals. Le Port et al in their study reported that in high transmission areas, the number of P. falciparum asymptomatic carriers, i.e. individuals harbouring parasites without clinical signs, is very high. The consequences and significance of such asymptomatic infections have been studied in diverse situations, but results have been contradictory. According to few authors, long-term asymptomatic carriage may represent a form of tolerance to the parasite in children building up their immune response, therefore, the asymptomatic carriage of parasites would protect these children from developing either a mild malaria attack or a more severe one, by keeping their immunity effective. These problems of AIs, APIs, consequences and meanings of APIs, immunological measurements and others, are related to the so-called, “Genetic Theory of Infectious Diseases”, which has gained some support among clinicians and geneticists, but has also encountered resistance among microbiologists and immunologists. Diagnosis of API is difficult because there are no clinical manifestations and parasite density remains very low. PCR-based tests are most appropriate for finding such low densities of parasites. The most accepted definition of API is presence of erythrocytic parasites in peripheral thick blood smears, an axillary temperature < 37.5°C and absence of clinical malaria symptoms, however, it varies among studies. Several studies defined API at admission moment only, but other ones followed up the subjects till 60 days,. Definition of clinical malaria symptoms is another complex issue; some studies considered only fever, while others included other nonspecific symptoms. The detection of P. falciparum gametocytes is another topic for consideration in API, because these cells do not cause disease and can be carried by infected individuals for up to 55 days post-clearance of asexual stages, therefore, gametocytes may or may not be detected in subjects with API. Significance of the plasmodial submicroscopic reservoir (PSR) to malaria elimination depends on its size, and recent studies have shown that PSR is large in low transmission areas. Consequently, it is essential to know the magnitude of both events, asymptomatic and submicroscopic plasmodial infections, since submicroscopic infections are a big component of asymptomatic infections, as observed in this study. Traditionally, malariologist have focused on patients (symptomatic subjects) with positive microscopy, but it is now understood that it is just a small part of the large number of infected individuals. Accurate estimation of PSR needs diagnostic test more sensible than microscopy and RDTs. The current antimalarial strategies are not enough for the elimination and eradication goals,,, and require shifting from passive surveillance to active surveillance, as well as additional intervention measures to deal with the asymptomatic and/or submicroscopic infections,,. Specifically in the case of pregnancy-associated malaria, accurate diagnostic tools with very high sensitivity and specificity are required for a regular antenatal screening in endemic areas. Every country with malaria transmission must carry out a systematic work to know its frequency of API and SPI in different endemic areas and populations [children (infants, preschool and school), adults, pregnant women, etc.]. In conclusion, APIs are very common even in low malaria transmission areas, and most of APIs are due to SPI. Additional diagnostic tools with more sensitivity and specificity are required to address the API and SPI infections. Every malaria endemic region/country should carry out systematic studies for accurate estimation of frequency for both API and SPI in different populations for planning appropriate intervention measures. This information might serve as a key to malaria elimination and eradication programmes. This study was supported by the Departamento Administrativo de Ciencia, Tecnología e Innovación, Colciencias (Project codes 111556933361, 111571149686) and Universidad de Antioquia (Project codes 2014-969, 2014-1008, Estrategia de sostenibilidad 2014-2015). Tietje K, Hawkins K, Clerk C, Ebels K, McGray S, Crudder C, et al. The essential role of infection-detection technologies for malaria elimination and eradication. Trends Parasitol 2014; 30(5): 259–66. Das P, Horton R. Malaria elimination: Worthy, challenging, and just possible. Lancet 2010; 376(9752): 1515–7. Overview of malaria elimination 2016. Geneva: World Health Organization 2016. Available from: http://www.who.int/malaria/areas/elimination/overview/en/ (Accessed on July 7, 2016). Laishram DD, Sutton PL, Nanda N, Sharma VL, Sobti RC, Carlton JM, et al. The complexities of malaria disease manifestations with a focus on asymptomatic malaria. Malar J 2012; 11: 29. Lindblade KA, Steinhardt L, Samuels A, Kachur SP, Slutsker L. The silent threat: Asymptomatic parasitaemia and malaria transmission. Expert Rev Anti Infect Ther 2013; 11(6): 623–39. Smith T, Schellenberg JA, Hayes R. Attributable fraction estimates and case definitions for malaria in endemic areas. Stat Med 1994; 13(22): 2345–58. Wu L, van den Hoogen LL, Slater H, Walker PG, Ghani AC, Drakeley CJ, et al. Comparison of diagnostics for the detection of asymptomatic Plasmodium falciparum infections to inform control and elimination strategies. Nature 2015; 528 (7580): S86–93. Mercereau-Puijalon O, Barale JC, Bischoff E. Three multigene families in Plasmodium parasites: Facts and questions. Int J Parasitol 2002; 32(11): 1323–44. Okell LC, Ghani AC, Lyons E, Drakeley CJ. Submicroscopic infection in Plasmodium falciparum-endemic populations: A systematic review and meta-analysis. J Infect Dis 2009; 200(10): 1509–17. Okell LC, Bousema T, Griffin JT, Ouédraogo AL, Ghani AC, Drakeley CJ. Factors determining the occurrence of submicroscopic malaria infections and their relevance for control. Nat Commun 2012; 3: 1237. Khan WA, Galagan SR, Prue CS, Khyang J, Ahmed S, Ram M, et al. Asymptomatic Plasmodium falciparum malaria in pregnant women in the Chittagong Hill Districts of Bangladesh. PLoS One 2014; 9(5): e98442. Francine N, Damien B, Anna F, Michael K, Christevy VJ, Felix KK. Characterization of asymptomatic Plasmodium falciparum infection and its risk factors in pregnant women from the Republic of Congo. Acta Trop 2016; 153: 111–5. Douamba Z, Bisseye C, Djigma FW, Compaoré TR, Bazie VJ, Pietra V, et al. Asymptomatic malaria correlates with anaemia in pregnant women at Ouagadougou, Burkina Faso. J Biomed Biotechnol 2012; 2012: 198317. Arango EM, Samuel R, Agudelo OM, Carmona-Fonseca J, Maestre A, Yanow SK. Genotype comparison of Plasmodium vivax and Plasmodium falciparum clones from pregnant and non-pregnant populations in north-west Colombia. Malar J 2012; 11: 392. Arango E, Maestre A, Carmona-Fonseca J. Efecto de la infección submicroscópica o policlonal de Plasmodium falciparum sobre la madre y el producto de la gestación. Revisión sistemática. Rev Bras Epidemiol 2010; 13(3): 373–86. Anorlu RI, Odum CU, Essien EE. Asymptomatic malaria parasitaemia in pregnant women at booking in a primary health care facility in a periurban community in Lagos, Nigeria. Afr J Med Med Sci 2001; 30(Suppl): 39–41. Anyaehie U, Nwagha UI, Aniebue PN, Nwagha TU. The effect of free distribution of insecticide-treated nets on asymptomatic Plasmodium parasitemia in pregnant and nursing mothers in a rural Nigerian community. Niger J Clin Pract 2011; 14(1): 19–22. Balogun ST, Adeyanju OA, Adedeji AA, Fehintola FA. Predictors of asymptomatic malaria in pregnancy. Niger J Physiol Sci 2011; 26 (2): 179–83. Hristov AD, Sanchez MC, Ferreira JJ, Lima GF, Inoue J, Costa-Nascimento MJ, et al. Malaria in pregnant women living in areas of low transmission on the southeast Brazilian Coast: Molecular diagnosis and humoural immunity profile. Mem Inst Oswaldo Cruz 2014; 109(8): 1014–20. Isah AY, Amanabo MA, Ekele BA. Prevalence of malaria parasitemia amongst asymptomatic pregnant women attending a Nigerian teaching hospital. Ann Afr Med 2011; 10(2): 171–4. Iwalokun BA, Iwalokun SO, Adebodun V, Balogun M. Carriage of mutant dihydrofolate reductase and dihydropteroate synthase genes among Plasmodium falciparum isolates recovered from pregnant women with asymptomatic infection in Lagos, Nigeria. Med Princ Pract 2015; 24 (5): 436–43. Kizito D, Tweyongyere R, Namatovu A, Webb EL, Muhangi L, Lule SA, et al. Factors affecting the infant antibody response to measles immunisation in Entebbe-Uganda. BMC Public Health 2013; 13: 619. Maïga-Ascofaré O, Rakotozandrindrainy R, Girmann M, Hahn A, Randriamampionona N, Poppert S, et al. Molecular epidemiology and seroprevalence in asymptomatic Plasmodium falciparum infections of Malagasy pregnant women in the highlands. Malar J 2015; 14: 188. Matangila JR, Lufuluabo J, Ibalanky AL, Inocêncio da Luz RA, Lutumba P, Van Geertruyden JP. Asymptomatic Plasmodium falciparum infection is associated with anaemia in pregnancy and can be more cost-effectively detected by rapid diagnostic test than by microscopy in Kinshasa, Democratic Republic of the Congo. Malar J 2014; 13: 132. McGready R, Boel M, Rijken MJ, Ashley EA, Cho T, Moo O, et al. Effect of early detection and treatment on malaria related maternal mortality on the north-western border of Thailand 1986-2010. PLoS One 2012; 7(7): e40244. Nasr A, Hamid O, Al-Ghamdi A, Allam G. Antimalarial IgG subclasses pattern and FcγRIIa (CD32) polymorphism among pregnancy-associated malaria in semi-immune Saudi women. Malar J 2013; 12: 110. Nega D, Dana D, Tefera T, Eshetu T. Prevalence and predictors of asymptomatic malaria parasitemia among pregnant women in the rural surroundings of Arbaminch Town, South Ethiopia. PLoS One 2015; 10(4): e0123630. Nwagha UI, Ugwu VO, Nwagha TU, Anyaehie BU. Asymptomatic Plasmodium parasitaemia in pregnant Nigerian women: Almost a decade after Roll Back Malaria. Trans R Soc Trop Med Hyg 2009; 103(1): 16–20. Nwaneri DU, Adeleye OA, Ande AB. Asymptomatic malaria parasitaemia using rapid diagnostic test in unbooked pregnant women in rural Ondo-South district, Nigeria. J Prev Med Hyg 2013;54(1): 49–52. Ogbodo SO, Nwagha UI, Okaka AN, Ogenyi SC, Okoko RO, Nwagha TU. Malaria parasitaemia among pregnant women in a rural community of eastern Nigeria: Need for combined measures. Niger J Physiol Sci 2009; 24(2): 95–100. Okusanya BO, Eigbefoh JO, Ohiosimuan O, Isabu PA, Okpere EE, Inyang NJ. Utility of intradermal blood smear in the detection of asymptomatic malaria parasitaemia in pregnancy. Niger Postgrad Med J 2009; 16(3): 182–5. Onyenekwe CC, Arinola OG, Salimonu LS. Detection of Plasmodium falciparum-IgG and incidence of asymptomatic malaria in pregnant women in Nigeria. Indian J Malariol 2002; 39(1–2): 39–42. Onyenekwe CC, Meludu SC, Dioka CE, Salimonu LS. Prevalence of asymptomatic malaria parasitaemia amongst pregnant women. Indian J Malariol 2002; 39(3–4): 60–5. Rijken MJ, Papageorghiou AT, Thiptharakun S, Kiricharoen S, Dwell SL, Wiladphaingern J, et al. Ultrasound evidence of early fetal growth restriction after maternal malaria infection. PLoS One 2012; 7(2): e31411. Sule-Odu AO, Ogunledun A, Olatunji AO. Impact of asymptomatic maternal malaria parasitaemia at parturition on perinatal outcome. J Obstet Gynaecol 2002; 22(1): 25–8. Thévenon AD, Zhou JA, Megnekou R, Ako S, Leke RG, Taylor DW. Elevated levels of soluble TNF receptors 1 and 2 correlate with Plasmodium falciparum parasitemia in pregnant women: Potential markers for malaria-associated inflammation. J Immunol 2010; 185(11): 7115–22. Umeh UA, Obi SN, Onah HE, Ugwu EO, Ajah LO, Umeh CR, et al. The impact of intermittent preventive treatment with sulfadoxine-pyrimethamine on the prevalence of malaria parasitaemia in pregnancy. Trop Doct 2012; 42 (3): 133–5. Wilson NO, Bythwood T, Solomon W, Jolly P, Yatich N, Jiang Y, et al. Elevated levels of IL-10 and G-CSF associated with asymptomatic malaria in pregnant women. Infect Dis Obstet Gynecol 2010; 2010: 317430. doi: 10.1155/2010/317430. Branch O, Casapia WM, Gamboa DV, Hernandez JN, Alava FF, Roncal N, et al.Clustered local transmission and asymptomatic Plasmodium falciparum and Plasmodium vivax malaria infections in a recently emerged, hypoendemic Peruvian Amazon community. Malar J 2005; 4: 27. Parekh FK, Davison BB, Gamboa D, Hernandez J, Branch OH. Placental histopathologic changes associated with subclinical malaria infection and its impact on the fetal environment. Am J Trop Med Hyg. 2010; 83(5): 973–80. Shannon KL, Khan WA, Sack DA, Alam MS, Ahmed S, Prue CS, et al. Subclinical Plasmodium falciparum infections act as year-round reservoir for malaria in the hypoendemic Chittagong Hill districts of Bangladesh. Int J Infect Dis 2016; 49: 161–9. Sutherland CJ. Persistent parasitism: The adaptive biology of Malariae and Ovale malaria. Trends Parasitol 2016; 32(10): 808–19. Le Port A, Cot M, Etard JF, Gaye O, Migot-Nabias F, Garcia A. Relation between Plasmodium falciparum asymptomatic infection and malaria attacks in a cohort of Senegalese children, Malar J 2008; 7: 193. Casanova J L, Abel L. The genetic theory of infectious diseases: A brief history and selected illustrations. Annu Rev Genomics Hum Genet 2013; 14: 215–43. Bottius E, Guanzirolli A, Trape JF, Rogier C, Konate L, Druilhe P. Malaria: Even more chronic in nature than previously thought; evidence for subpatent parasitaemia detectable by the polymerase chain reaction. Trans R Soc Trop Med Hyg 1996; 90(1): 15–9. Mahajan B, Zheng H, Pham PT, Sedegah MY, Majam VF, Akolkar N, et al. Polymerase chain reaction-based tests for panspecies and species-specific detection of human Plasmodium parasites. Transfusion 2012; 52(9): 1949–56. Alves J, Roque AL, Cravo P, Valdez T, Jelinek T, Rosário VE, et al. Epidemiological characterization of Plasmodium falciparum in the Republic of Cabo Verde: Implications for potential largescale re-emergence of malaria. Malar J 2006; 5: 32. Butterworth AS, Skinner-Adams TS, Gardiner DL, Trenholme KR. Plasmodium falciparum gametocytes: With a view to a kill. Parasitology 2013; 140(14): 1718–34. Ouédraogo AL, Bousema T, de Vlas SJ, Cuzin-Ouattara N, Verhave JP, Drakeley C, et al. The plasticity of Plasmodium falciparum gametocytaemia in relation to age in Burkina Faso. Malar J 2010; 9: 281. doi: 10.1186/1475-2875-9-281. Imwong M, Nguyen TN, Tripura R, Peto TJ, Lee SJ, Lwin KM, et al. The epidemiology of subclinical malaria infections in Southeast Asia: Findings from cross-sectional surveys in Thailand-Myanmar border areas, Cambodia, and Vietnam. Malar J 2015; 14: 381. Sturrock HJ, Novotny JM, Kunene S, Dlamini S, Zulu Z, Cohen JM, et al. Reactive case detection for malaria elimination: Reallife experience from an ongoing program in Swaziland. PLoS One 2013; 8(5): e63830. Sturrock HJ, Hsiang MS, Cohen JM, Smith DL, Greenhouse B, Bousema T, et al. Targeting asymptomatic malaria infections: Active surveillance in control and elimination. PLoS Med 2013; 10(6): e1001467. Disease surveillance for malaria elimination: An operational manual 2012. Geneva: World Health Organization. Available from: apps.who.int/iris/bitstre am/10665/44852/1/9789241503334_eng.pdf (Accessed on July 9, 2016).